On a suggestion from a friend I got a good chuckle so I have borrowed the heading and idea for this nod to Mr. Reynolds. I was there when Burt’s career as a big screen star attraction was spiraling out of control in the latter part of the 1980’s but I had the luxury of catching all his seventies titles on late night television growing up. It seemed that the press was constantly looking to each new release to see if Burt was going to recapture the magic of his earlier output. Expectation levels always seemed a might high to live up to and rather unfair. Truthfully I always felt that his huge 1977 box office hit Smokey and the Bandit proved something of a curse as it seemed he was constantly trying to top it with inferior product like Stroker Ace and Cannonball Run. 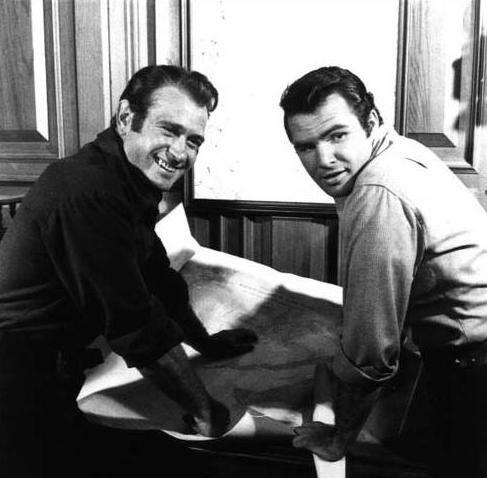 Burt’s reputation probably hasn’t been helped by appearing in countless low budget films in later years unlike his seventies contemporaries Newman, Redford and Eastwood. First up if your looking to find some early footage of Burt you can pick up the TV series Riverboat where he played second lead to Darren McGavin. It’s available on DVD and I’ve slowly been working through it. For Burt’s film career you could check out Navajo Joe from 1966 if you care to see him follow many other American leading men to Europe for a Sergio Corbucci Spaghetti Western. Then there’s the explosive 100 Rifles in 1969 with Jim Brown and Raquel Welch. 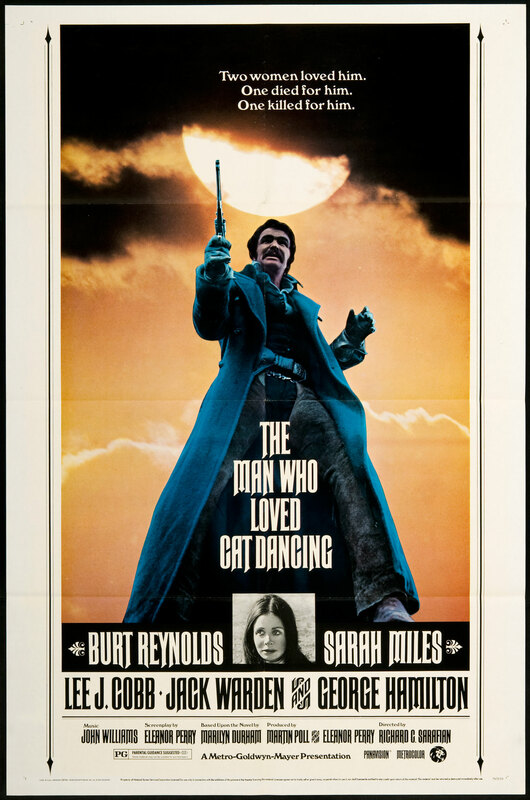 I recall seeing The Man Who Loved Cat Dancing as a kid on TV and loving both the cast and the western side of Burt’s on screen persona. The good ole’ boy character was on fine display with Burt’s 1973 film White Lightning, teaming him with Deliverance pal Ned Beatty and good old boy Bo Hopkins. It’s the tale of an ex-con and the moonshine industry. Reynolds fit’s this role perfectly and has his own agenda culminating in a perfect ending. Burt would star in and direct a sequel to this titled Gator in 1976 that also featured his country music buddy Jerry Reed. No way one can ignore the Robert Aldrich film The Longest Yard when putting a list together of both Burt titles and sports films worth catching. It’s the classic cons vs. the guards game in Eddie Albert’s prison. Burt leads the cons against Ed Lauter and the guards in a comic delight. Remade years later with Adam Sandler it was nice to see that film let Burt in on the action and carry the ball in the big play. 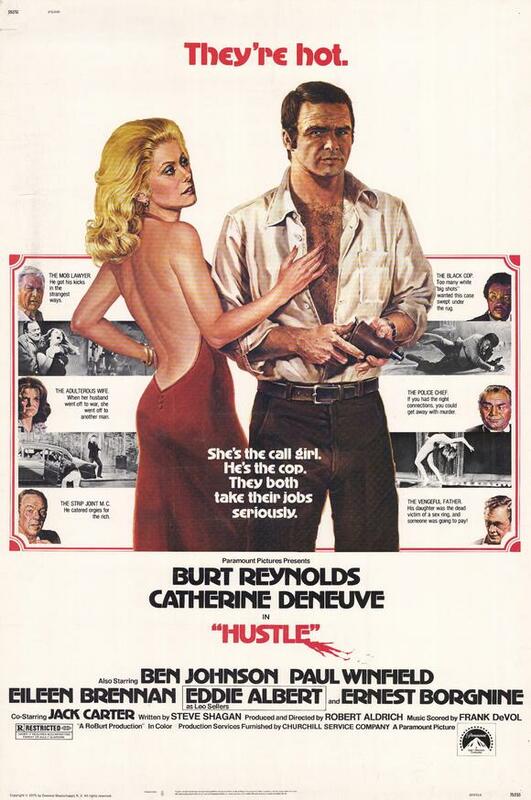 Burt would again team up with director Aldrich for the cop flick Hustle casting Burt opposite French beauty Catherine Deneuve. 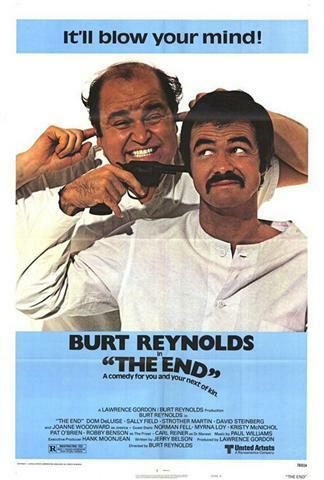 Burt once again did double duty starring and directing in The End. It’s a hilarious black comedy of a man who wants to end his life and seeking the help of a maniac played by Dom DeLuise. Of all the titles on this list I think this one might be the hidden gem to seek out. Lastly I’ll toss another cop film into the mix. Sharky’s Machine. It’s a mean and gritty effort where Burt heads a group of police officers and they set out to take down screen nasty Henry Silva while Burt romances gorgeous Rachel Ward. Sure it’s a reworking of the Noir classic Laura but Burt does a fine job here both starring in and directing some top notch action sequences. Looking at Burt’s filmography I total 49 films seen. So there are still plenty I have to catch up on and feel free to shoot me some suggestions. Perhaps I have seen them but then again there might be something flying under my radar. Burt did have a comeback of sorts with his Oscar nominated performance in Boogie Nights and yes I would liked to have seen him claim the prize though that still wouldn’t have convinced me the film was worth seeing a second time. Sorry all you Dirk Diggler fans. For the record my earliest recollection of seeing Burt on the big screen as a kid was the film Hooper. Not sure who dragged me along but glad they did. So go back and give some of these Burt titles a shot if you already haven’t. Plenty of fun viewing time to be had. That friend had a fun idea but you ran with it, hope you do more! I like SHARKY’S, and that poster for CAT DANCING, a movie you introduced me to, is so fabulous, he looked fantastic in it. Of these I haven’t seen HUSTLE, that’s an interesting combo of actors. Good choices! Never did see those Dan August flicks so will have to remedy that. The End hits me square on the funny bone and yes a new Sharky would have been nice. 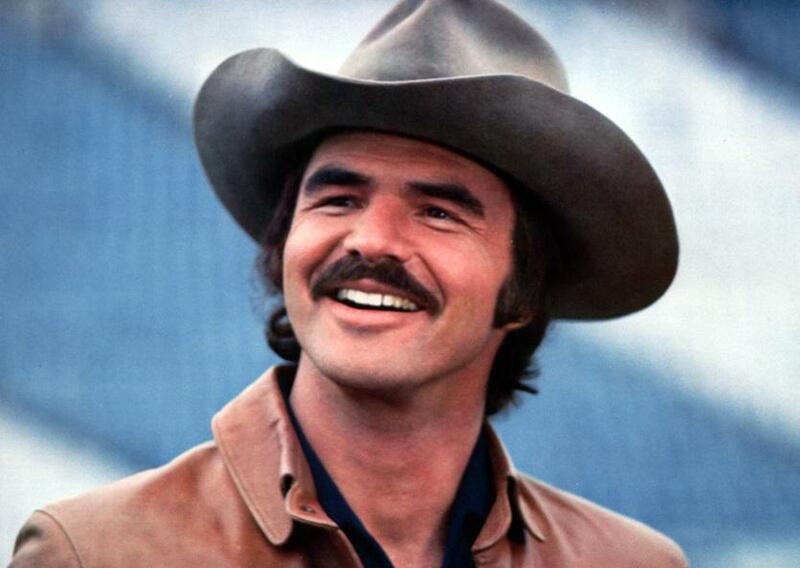 Long live “the Burt”. I knew they were a TV show but missed them on the way. He did a very good job in the early Gunsmokes, and then there was Evening Shade, a very good sitcom with an excellent cast. I worked a one- man show of Burt’s. He was just as funny off stage as he was on stage. DELIVERANCE though was the top of his works. I’ve been watching some of those Gunsmoke episodes lately. Never did get into Evening Shade. Thanks for sharing a bit on Burt. Always been a fan. Ah, Mike. You’ve convinced me to track down a copy of Smokey and the Bandit. What a huge hit at the box office and I’ve always felt a bit of a curse. Kept trying to recycle it’s success like so many actors do. Cannonball Run, the sequels to it and Smokey and Stroker Ace etc….. Not really a decent film among them other than some comical bits within each film. But Smoke? Pure box office delight. A slight correction: White Lightning doesn’t co-star Jerry Reed, you’ve mixed him up with Bo Hopkins, who does resemble Jerry, (& in fact an 80s low budget programmer, [as in direct-to-video type IIRC], starred Bo & Jerry as brothers, the title of which escapes me), & who is Burt’s co-star in White Lightning. Jerry first co-stared with Burt in WW & The Dixie Dance Kings in 75, which came out after White Lightning. Jerry was in Burt’s sequel to White Lightning, Gator.